A Time Traveller's Guide to South Africa in 2030 introduces a brand new set of scenarios that explains what is happening in the country, why it is happening, and what is going to happen next. South Africa has undergone dramatic change in recent years. Political tensions are on the up, economic performance has weakened, and more and more South Africans are taking their frustrations to the streets. The scenarios explain what this means for our future and what South Africa will look like in 2030. Will a spark ignite the powder keg? Will South Africa take the socialist route and allow the state to seize all wealth and land? Will the status quo prevail, and the wealth divide widen while crime soars? Do we face a pernicious erosion of our democratic rights and freedoms? Or will a rainbow rise unexpectedly? The book is the second in a trilogy of books that have been planned to map the route South Africa will take to its next economic and political transition. The trilogy is based on doctoral research conducted by IRR CEO, Frans Cronje. The first book in the trilogy was published in 2014 as A Time Traveller’s Guide to Our Next Ten Years. The third book will be published within a year of the 2019 election. The books use first-hand political information and deep-dive economic and social research to predict how South Africa’s long-term future will evolve. Briefings on the scenarios have become a staple of the strategic planning efforts of groups invested in South Africa. Briefings should be booked through Sherwin van Blerk and can be conducted in your office. 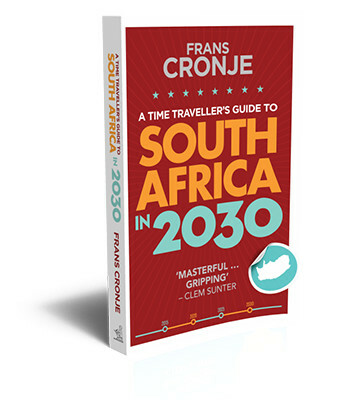 To find out more about scenarios and the Time Traveller’s Guide to South Africa series, visit www.frans-cronje.com. Clem Sunter described A Time Traveller's Guide to South Africa in 2030 as ‘masterful’.